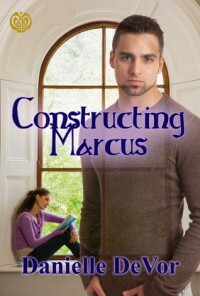 Danielle Devor's novel, Constructing Marcus, is a sad, but certainly accurate, statement about today's affluent society. Emma Hoffman, an endearing, lonely teenager, is trying to make sense of her life within the confines of her dysfunctional family: an anorexic mother and a workaholic father. The mother is so focused on her self-image that she is unable to offer her daughter the affection she so needs. When Emma hugs her and tells her how proud she is of her efforts to fight her disease, the mother's reaction is to simply detach herself, and simply say she was glad. Contact with her father is limited to his cameo-appearances when they share a quick sandwich or take-out food between his shifts at the hospital. Emma feels powerless in her constant efforts to save her mother from falling prey to her fatal disease and or to stop her father from the eventuality of a nervous breakdown. The likelihood of losing the people she loves is a constant worry as she watches them deteriorate bit by bit. She turns towards something less painful -- ghost hunting -- ghosts are already dead, so they can't hurt her. Whatever friend she had was left behind when her father moved the family to an older house near to his work. Emma is left to take care of her mother but has a lot of time on her hands to explore the old house. She puts her ghost-hunting skills to work in her new home and discovers Marcus, a construct created by a witch who was murdered by a wizard. Emma's life takes on a new meaning. Besides trying to save her own parents, she must now try to protect her new friend from the evil wizard. Will Emma's life gain a bit of normalcy with Marcus, who, by the way has awakened sharp emotional and physical needs within her? This is a wonderful young adult story with well-fleshed characters any reader can relate to.